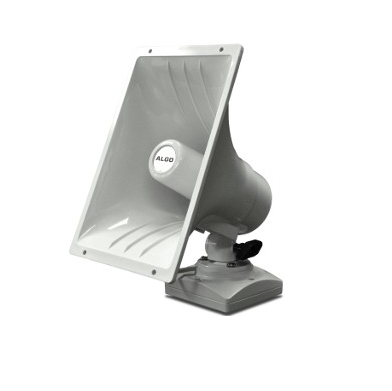 The 8186 is a weatherproof SIP compliant IP horn/loudspeaker for voice paging, loud ringing, and emergency/safety/security notification and alerting. The speaker is PoE and does not require an additional amplifier. Common application environments include: warehouse, factory (e.g., OSHA), production floor (e.g. food and beverage processing), utility plant, machine shop, garage, parking lot/outdoor yard, school playground and gymnasium, farm, bus or train terminal, etc. The 8186 speaker registers as a third party SIP endpoint with all leading premise or hosted UC providers. For multiple speaker deployments, additional devices do not require a SIP license. A single registered speaker can be configured to multicast to any number and mix of additional Algo speakers, strobes and/or paging adapters as required, providing cost-effective scalability using a minimum of network traffic. For multicast page applications, zoned paging is supported as a SIP extension or as a keypress selectable zone.